While many organizations are rushing to develop field service apps, many initially fail because they do not include critical features necessary to make field workers productive on a mobile device. 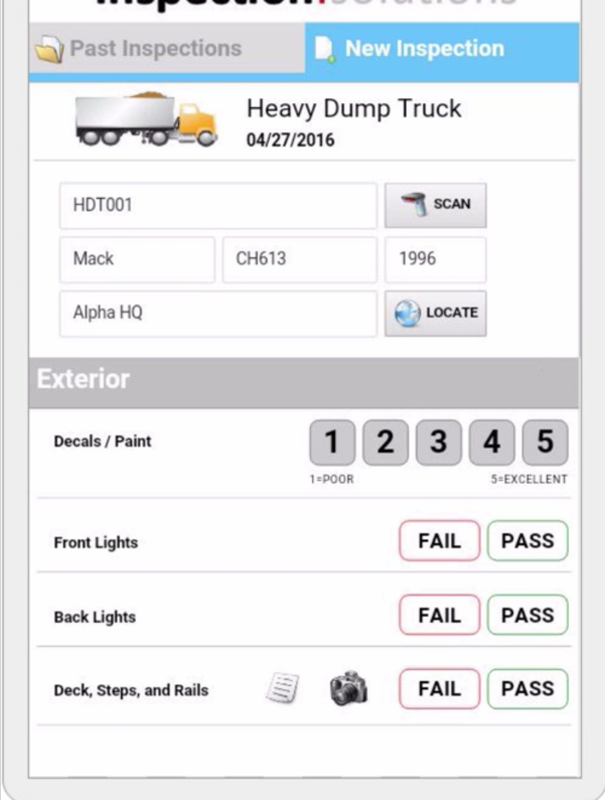 This mobile inspection app showcases important mobile app features and an outstanding user experience now required in modern field service apps. Developers can modify or reference this app for their own mobile app projects. 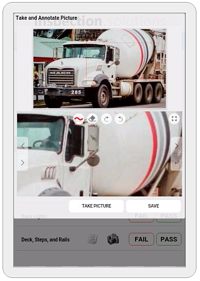 Inspection Solutions is a mobile business app designed for field workers who need to inspect construction vehicles in the field. 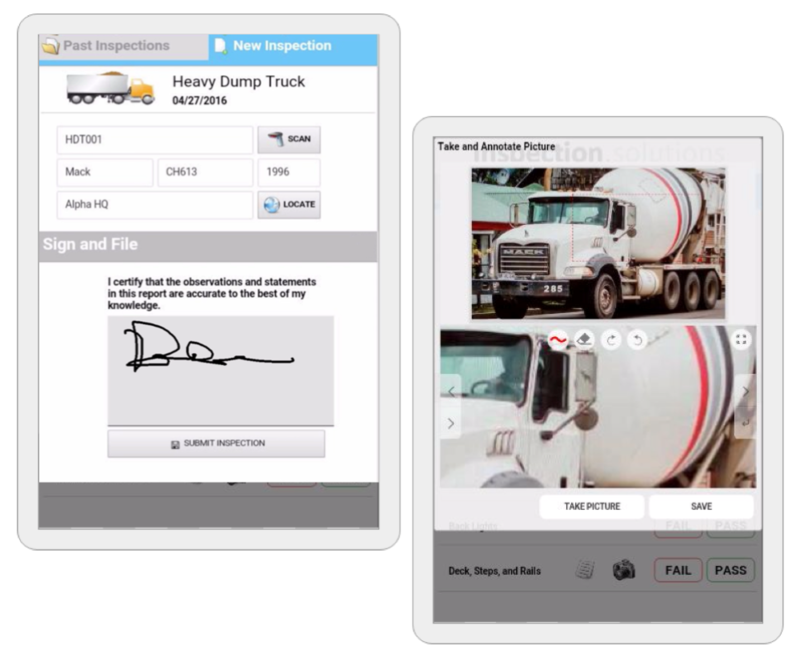 The app showcases critical features now required in many modern field services apps, such as offline capability, bar code scanning, voice annotation and digital ink. It is a native-quality hybrid app created using the Alpha Anywhere rapid mobile application development and deployment platform. While targeted for use on an inexpensive tablet—in this case an 8" Android tablet from Acer—it works just as well on higher end Android models. In addition, while optimized for tablets, the Inspections Solutions app is responsive and can also work on smartphones. After opening the app, users scan QR codes (using their device's camera) to look up properties about the vehicles they are scanning. 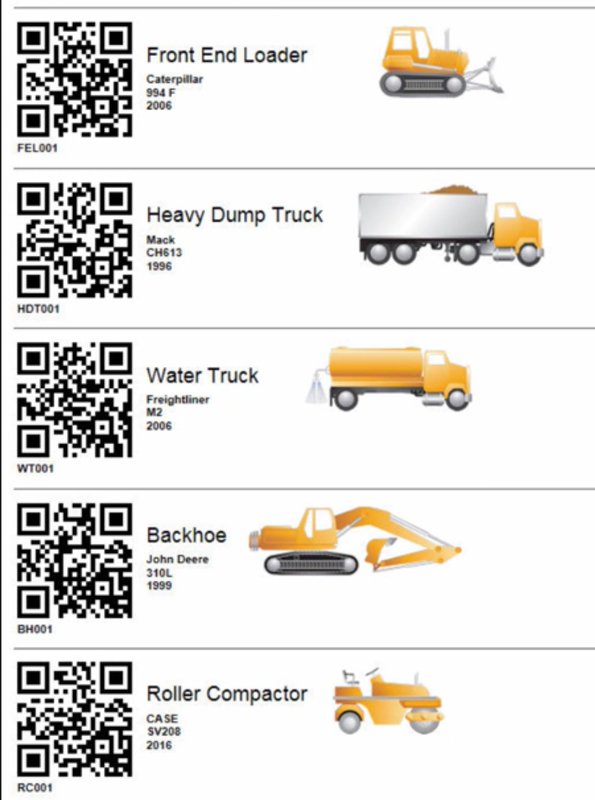 A sheet of six QR codes for different types of vehicles is supplied with the app so users can walk through the user experience for different types of vehicles. Data about the vehicles are stored in a client-side data cache that comes with the application. Users then see an intuitive interface optimized for a remote worker who must capture detailed inspection data using one-hand or finer. 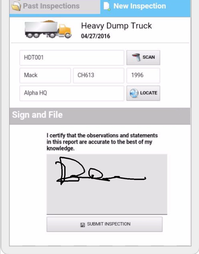 When the inspector finishes inspecting the construction vehicle, s/he signs the signature capture control and submits the record to be synchronized with the data source of the user's choice. Please note: No backend data structure is provided. You can connect it to the data source of your choice, or it can be used as a learning tool to see how the interface was built. All of the source code for the Inspection Solutions sample application is available on the Alpha Software GitHub account. Instructions for getting and installing an Alpha Anwyere project from GitHub can be found here. Want Help Customizing Your App? Inspection Solutions was created using out-of-the-box Alpha Anywhere functionality and is easy to modify. If you like this app, but need assistance modifying it for your specific needs, the Alpha Software Consulting Services Group can help. This application requires the latest version of Alpha Anywhere. All Alpha Anywhere subscribers have full access to Inspection Solutions for modification and deployment. Become a subscriber or renew your expired subscription to gain access. Not an Alpha Anywhere Customer? Register for a 30-day trial of Alpha Anywhere to get access to this app, and during your trial you will be able to test and modify this application.